The largest cruise ship to visit the Hunter region made its maiden voyage into Newcastle Harbour on Sunday, Feb. 10. Royal Caribbean’s Explorer of the Seas, a 310-metre long cruise ship accommodating up to 4000 guests and 1200 crew, arrived at 8am before a 5pm departure. It was estimated passengers would inject more than $600,000 into the regional economy during the visit. Port of Newcastle and the ship’s Captain Kjetil Gjerstad exchanged a plaque on the ship’s bridge to mark the maiden voyage. A U.S. Coast Guard H-60 "Jayhawk helicopter medevaced a man who suffered a medical emergency from the "Explorer of the Seas" 200 miles offshore on Oct 6, 2018. The Oregon-based Coast Guard helicopter crew rescued the 67-year-old man who suffered a possible stroke. The cruise ship was in the middle of a nearly six-day trip from Seattle to Hawaii, according to its itinerary. A C-27 Spartan airplane from Sacramento was also launched to facilitate communications. The ship's crew requested a medical evacuation around 2 p.m. when the man appeared to be suffering a diabetic emergency and showed signs of a stroke. Once the helicopter arrived at the Astoria Airport, a second air ambulance took the man to Providence St. Vincent Medical Center in Portland. His condition was not disclosed. 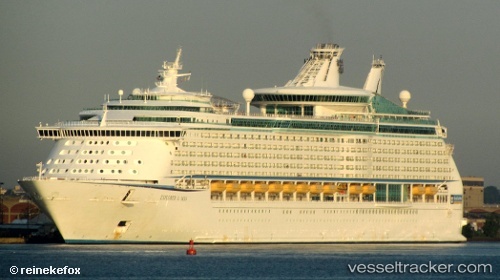 The "Explorer of the Seas" was returning from Alaska and heading to Seattle when on July 19, 2018, at 8:21 p.m. the Joint Rescue Coordination Centre Victoria was alerted after two crew members reportedly fell into the water, after boarding one of the ship’s rescue boats. The JRCCwas uncertain why the crew were in the rescue boats, but they may have been running drills. They fell from some height and were rescued by the pilot boat of the Pacific Pilotage Authority. Both were still responsive. The rescue boat broke down and was towed by the "Vic 1" boat before it restarted, when it could be cut free and hoisted back on board. The two crew members were sent to hospital, but C-Tow said they were checked out by B.C. Emergency Health Services, given the okay, and put back on board.